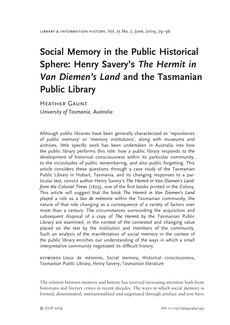 Although public libraries have been generally characterized as ‘repositories of public memory’ or ‘memory institutions’, along with museums and archives, little specifi c work has been undertaken in Australia into how the public library performs this role: how a public library responds to the development of historical consciousness within its particular community, to the vicissitudes of public remembering, and also public forgetting. This article considers these questions through a case study of the Tasmanian Public Library in Hobart, Tasmania, and its changing responses to a particular text, convict author Henry Savery’s The Hermit in Van Diemen’s Land: from the Colonial Times (1829), one of the fi rst books printed in the Colony. This article will suggest that the book The Hermit in Van Diemen’s Land played a role as a lieu de mémoire within the Tasmanian community, the nature of that role changing as a consequence of a variety of factors over more than a century. The circumstances surrounding the acquisition and subsequent disposal of a copy of The Hermit by the Tasmanian Public Library are examined, in the context of the contested and changing value placed on the text by the institution and members of the community. Such an analysis of the manifestation of social memory in the context of the public library enriches our understanding of the ways in which a small interpretative community negotiated its diffi cult history.